Multiple Intelligences Introduction Dr. Howard Gardner, a Harvard professor, first proposed the Multiple Intelligences. Dr. Gardner noted that humans are made up of multiple intelligences, the main eight intelligences being: linguistic intelligence, logical-mathematical intelligence, spatial intelligence, bodily kinaesthetic intelligence, musical intelligence, interpersonal intelligence, intrapersonal intelligence, and naturalist intelligence. This theory emphasized that kids’ intelligences can be unleashed to a higher level with education. The Multiple Intelligence theory strongly influenced and helped to revolutionize the American education system successfully. Linguistic Intelligence Linguistic intelligence is the ability to use language to express what's on our minds and to understand other people. Educator notes that kids of 2-8yrs are sensitive to learn language. Therefore, our daycare ensures that every day kids have numerous opportunities to use language in authentic and increasingly skillful and diverse ways. For example, in the Circle Time, kids are invited to share, listen, and respond, and during those casual yet meaningful conversations with teachers about the world and their place in it, linguistic intelligence is throughout the procedure. Our teachers are quick to be playful with language, bringing the joy of words into these interactions. Logical-Mathematical Intelligence LM intelligence encompasses the ability to think logically and to use and manipulate numbers, quantities, and operations. For example in Canada, the beautiful autumn, we let kids count numbers while picking up maple leaves, and then they learn how to sort and count the leaves by color. This situation learning is the easiest way for kids, it can enhance their ability to count numbers and think logically. And beyond counting? There is sorting and categorizing, measuring, recognizing patterns. Bodily-Kinesthetic Intelligence Like all the intelligences, BK involve more intentional or purposeful use of fine and gross motor abilities to “solve a problem” or “make a product”. The product might be expressing an idea through choreography or dance. BK is movement with meaning — movement with a purpose, be it in the athletic (e.g. agility), artistic (e.g. expression), or scientific (e.g. precision) realms. Our teachers think about setting up the environment and activities so that they can put kids’ BK to use with intention to solve and make something. 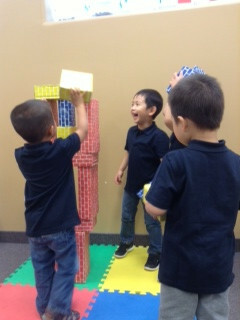 Every day at Top Mandarin Daycare, our teachers play games with kids (e.g. “What’s the time Mr. Wolf”), music and movement exercises (e.g. “find cats”), and interactive games (e.g. “Rainbow Umbrella”). These types of simple activities can help achieve long-reaching skills that will assist children later in life. Musical Intelligence Musical intelligence involves perceiving and understanding patterns of sound and includes creating and communicating meaning from sound. Therefore, its reach goes beyond the domain of music. Like other intelligences, musical intelligence works in combination with other intelligences, in everyday activities and in specialized activities and domains. For most kids, singing is as natural as talking. Even very little kids can be observed swaying, bouncing, or moving their hands in response to music or other rhythmic sounds they hear. Many kids make up songs, and with no self-consciousness, sing to themselves as they work and play. Kids in Top Mandarin Daycare have “Music Moment” every day. They sing songs in English and Chinese. Our teachers know that there are many reasons children need to have musical experiences in their lives. One is that it helps them build up confidence, and singing together helps children come together as a community. When children sing together in groups, they are learning to take direction, practicing self-discipline, working as a team, and just having fun! Spatial Intelligence Spatial intelligence runs high in the arts, for example the visual arts; and in the sciences, for example geology. Daily, we use spatial intelligence to find our way to a destination, read a map, rearrange toys; plan a garden and so on. 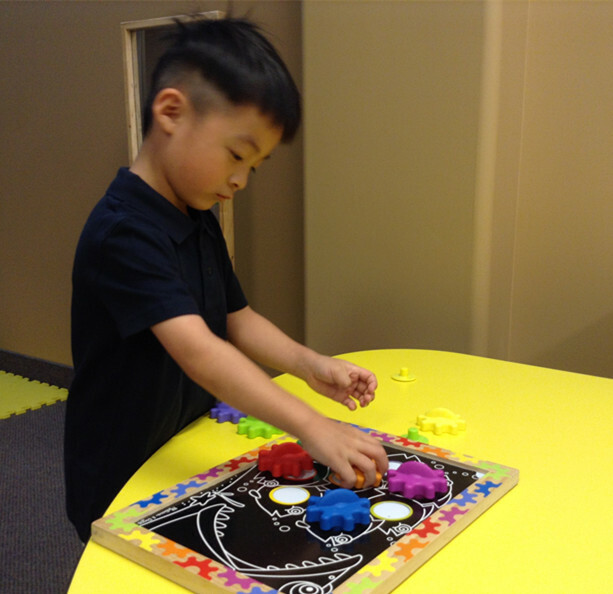 In the everyday context of free play, kids at Top Mandarin Daycare explore spatial relationships in a number of ways, using a variety of learning materials and tools. When kids are building with Lego or wooden blocks, they are developing geometric and scientific as well as spatial thinking. Our classroom environments by their very design – materials rich – and our daily schedule – long blocks of time with the freedom to choose – give children numerous opportunities to perceive and represent the visual and spatial world with increased accuracy. Interpersonal Intelligence Every day, kids in Top Mandarin Daycare interact with their peers and their teachers, learning valuable lessons about themselves and the people around them. The most effective tool that our teachers use to help children understand the meaning of being sensitive to others is modeling. For example in the “Make a Call” game, our teachers model interpersonal intelligence by inviting kids to interact with them by phone, speaking politely, being an active listener, engaging in conversations frequently, and providing verbal encouragement to children as they refine and expand their understanding of the meaning of being sensitive to others thoughts, feelings, and actions. Intrapersonal Intelligence Intrapersonal Intelligence is the capacity to understand oneself ---one’s thoughts and feelings --- and to use such knowledge in planning and directing one’s life. Top Mandarin teachers help kids develop their Intrapersonal Intelligence by encouraging them to identify and communicate their thoughts and moods with phrases like “Tell me how you are feeling,” “Use your words to tell her what you need,” and “Is there any other ways you can choose to solve this problem?” Our teachers consciously work to help children develop both their personal intelligences (intra and inter), know their strengths, and know how they are perceived by others. Naturalist Intelligence Naturalist intelligence involves understanding and working well with the natural world, distinguishing and using features of the environment, and keen observational and discrimination skills. Our teachers value the time that kids spend outdoors as much as they value class time. Not only does outdoor time nurture the naturalist in every kid, it also provides an opportunity for kids to bond with the natural world, and understand and care for nature. For example, we take kids to find flowers in spring, look for the home of ants in summer, pick apples in autumn and see snowflakes in winter etc.